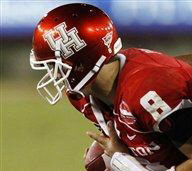 Red shell with interlocking white "UH" outlined in blue, gray facemask. Red shell with interlocking white "UH" outlined in blue,thin white-red-white stripes, gray facemask. 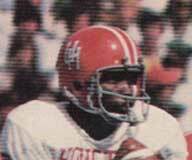 The predominant "look" under Coach Bill Yeoman, and the helmet was Houston's look when entering the conference in 1976. Helmet shells are Macgregor, Riddell, and Rawlings. Red shell with interlocking white "UH" outlined in blue,thin white-red-white stripes,white facemask. Only a white facemask update. Helmet shells are Macgregor, Rawlings, and Riddell. 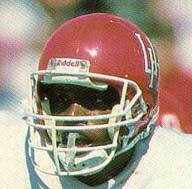 Red shell with interlocking white "UH" outlined in blue, white facemask. After the retirement of Bill Yeoman, this look was used under coaches Jack Pardee, John Jenkins, and Kim Helton. 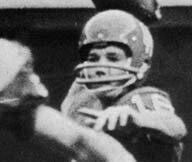 Helmet shells are Riddell (predominately) and Schutt. 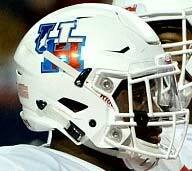 Red shell with interlocking bold white "UH" outlined in blue (both letters interlock, with no individual outline), white facemask. 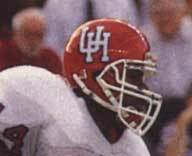 Houston slightly changed the "UH" on the sides of the helmet to a more bolder look, and each letter was no longer individually outlined in blue. In Coach Kim Helton's last year, Houston changes the interlocking "UH" decal on the side of the helmet for the first time since 1963. Helmet shells are Riddell and Schutt. 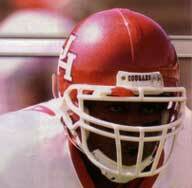 Red shell with interlocking horizontally extended white "UH" outlined in navy, white facemask. Same look as previous football helmet design, with the stripes being dropped and the blue outline of the "UH" changing to navy. Helmet shells are Riddell and Schutt. Red metallic shell with interlocking horizontally extended white "UH" outlined in navy, white facemask. Only change is the metallic red shell. Helmet shells are Riddell and Schutt. 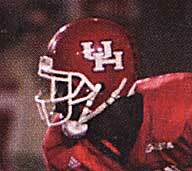 Red metallic shell with interlocking horizontally extended white "UH" outlined in navy, stylized cougar head superimposed on top of "UH,"white facemask. Special decal worn only for the Grambling game. Red metallic shell with interlocking horizontally extended white "UH" with gray accents outlined in white, white facemask . New helmet design removes the navy outline. 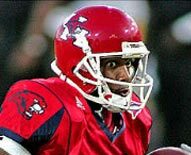 White shell with interlocking horizontally extended red "UH" outlined in red, white facemask. 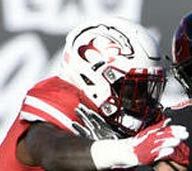 New white helmet introduced as an alternate in 2013. 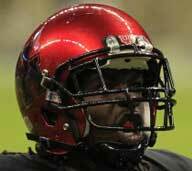 Red metallic shell with interlocking horizontally extended black "UH" outlined in black, black facemask. Special "Halloween" helmet worn on 10/31/2013. White shell with stylized cougar head on sides in metallic red, metallic red facemasks. Worn a few times in 2016 and worn in the Las Vegas Bowl against SDSU. 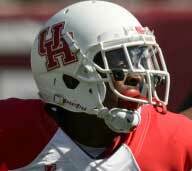 White shell with interlocking horizontally extended state of Texas flag design "UH" outlined in red, white facemask.